Floor Standing Speakers aren’t just like any other speakers. Namely, they’re virtually a living” piece of your home, as they both look and perform amazingly. Now, we’ve brought you a list of the top 10 Best Floor Standing Speakers Under $500 from top names in the electronics industry, like Yamaha, Sony, JBL, and more. The menu of top speakers we’ve prepared for you is quite versatile, and you can expect quite a lot. Ranging from low-end budget speakers to premium-quality high-end floor standing speakers. Let’s get right to it. The first item in our list of the best floor standing speakers is Onkyo’s SKF-4800. This is a magnificent speaker pair that excels in various fields of performance, of which aesthetics and features are the most notable ones. Essentially, these speakers are very expensive, but they’re more than worth the cash. Onkyo’s SKF-4800 Bass Reflex Floor Standing speakers are outfitted with twin cone woofers and a soft-dome tweeter. Needless to say, these are the most important features of SKF-4800, as they’re “responsible” for its outstanding performance. The maximum input power is estimated at 130 watts, so you can easily host a loud party anytime with them. On top of that, the speaker posts are compatible with most conventional banana plugs. Furthermore, the woofer equalizer allows for fast, accurate response. If you’re looking for a good floor standing speaker, Onkyo’s SKF-4800 is the answer. Sadly, Onkyo’s SKF-4800 floor standing speakers are very expensive. Anyhow, they’re more than valuable for the cash. The overall Value Rating Onkyo’s SKF-4800 of is 96/100. These speakers boast a massive value for the cash due to superior reliability and performance. The next item on the menu is Klipsch’s R-24F Floor Standing Speaker. Basically, this model is extraordinarily beautiful, it boasts a high level of performance, and it features state-of-the-art technologies and hardware. It belongs to the same price point category as our top pick (Onkyo SKF-4800), and it can be considered as a runner-up for the best floor standing speaker. The first thing you’ll notice about Klipsch’s R-24F floor standing speaker is the dazzling outward appearance. This speaker excels in aesthetics, and it’s easily one of the most beautiful floor standing speakers out there. Furthermore, it features a dynamic linear travel suspension tweeter made of aluminum, two copper-spun IMG woofers, and a brushed black veneer cabinet made of polymer. All in all, it’s safe to say that the features of Klipsch’s R-24F floor standing speaker are all but ordinary. Expert setup costs quite a lot, but the ordinary setup is free. The overall Value Rating of Klipsch’s R-24F floor standing speaker is 90/100. It’s a beautiful floor standing speaker, but it’s also an expensive one. Nevertheless, it holds a huge value for the cash. As we’re getting closer to the “medium” price point category, it’s only fitting that we open up with one of the major speakers. We’re looking at Samsung’s TW-J5500 2.2 Channel Audio Sound Tower. Essentially, we’re looking at a speaker powerhouse, as this is one of the most powerful party-starters out there. Even though Samsung’s TW-J5500 2.2 Channel Audio Sound Tower might not be the most affordable floor-standing speaker on the market, it’s well worth the cash, that much is guaranteed. First of all, these are so-called “twin” speakers – a speaker pair that shares identical features. Furthermore, Samsung’s TW-J5500 isn’t called “Audio Tower” for no reason. Namely, it’s a pair of long speakers that boasts 350 watts of maximum power. There’s a built-in subwoofer of 6 inches, but you’ll also be able to plug in your USB devices or use optical and Anynet inputs at your leisure. Last, but not least, these speakers are Bluetooth friendly. The overall Value Rating of Samsung’s TW-J5500 2.2 Channel Audio Sound Tower is 92/100. What these floor standing speakers lack in versatility they make up in performance and power. Overall, they boast a surmountable value for the cash. JBL boasts a large catalog of premium-quality speakers, and their “Arena F27” is a true representative of their craftsmanship. Even though these guys primarily deal with wall-mountable speakers, you’ll be amazed at the quality of their floor standing speakers. Generally, the JBL Arena F27 floor standing speaker is a decently affordable, beautiful, and powerful speaker that boasts a high value for the price. First of all, there’s a 1″ dome tweeter that allows for powerful, yet clean highs. The dual polycellulose 7″ woofers provide full-spectrum sound, honing up to JBL’s name. Additionally, the HDI (as in high-definition imaging) technology offers a welcome boost to the already great performance. Lastly, the cabinet shape design looks beautiful and modern. It’s sturdy enough to withstand quite a punishment, so you can rest assured that there are no major issues concerning durability. The overall Value Rating of JBL Arena F27 floor standing speaker is 94/100. 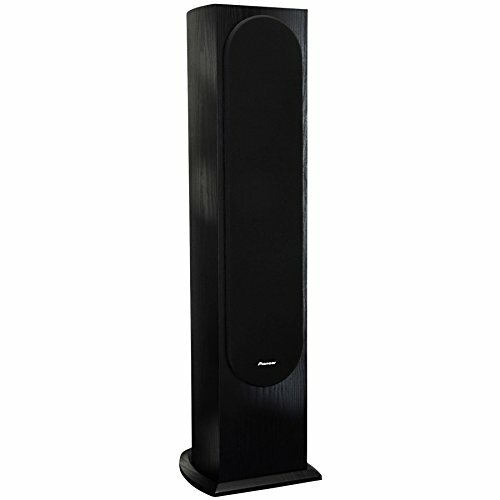 Basically, this floor standing speaker is remarkable in various aspects of performance. It’s durable, versatile, and quite affordable. Next item on our list of the best floor standing speakers is Yamaha’s NS-F210BL Bass-Reflex Floor Standing Speaker. These speakers are characterized by a distinctive outward appearance, they don’t cost too much, and they come outfitted with a set of high-quality features. They might not be the best floor standing speakers of all time, but they’re surely worth the money. Yamaha’s NS-F210BL speakers are twin 2-way floor standing bass-reflex speakers that were specifically designed to excel in performance. They output a full-spectrum, dynamic sound, and they sound the same regardless of volume. These speakers are outfitted with aluminum cones that are built-in the woofers, allowing for supremely fast and accurate response. As we’ve mentioned earlier, Yamaha’s NS-F210BL speakers are beautiful. They were designed to be slim, resembling the design of a flat-panel TV. The construction of these speakers is hard and robust, so don’t worry about durability. 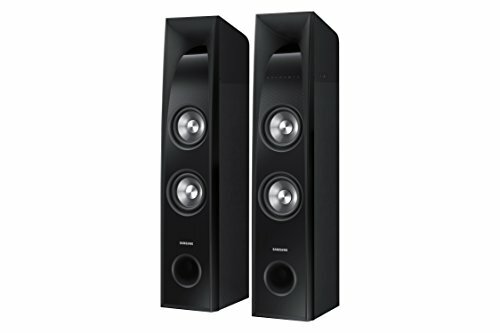 The overall Value Rating of Yamaha’s NS-F210BL floor standing speakers is 92/100. Overall, these speakers boast a high value for the cash, but there are minor flaws that are not to be overlooked. Polk Audio’s Monitor 70 is an old-school floor standing speaker that comes at a fair price, offering a good performance and plenty of versatility. Essentially, this is a medium-priced speaker that features a set of decent features, and it’s a keeper – it will last you for years to come due to its high durability. Polk Audio’s Monitor 70 comes outfitted with a 1″ fabric composite dome tweeter that’s supplied with a neodymium magnet. Furthermore, there’s a 6.5″ bi-laminate dynamic driver that allows for a decent bass output, albeit with a little distortion. These speakers also come supplied with a cascade array design, and non-resonant MDF enclosure. The overall Value Rating of Polk Audio’s Monitor 70 is 87/100. This floor standing speaker is pretty great overall, and it holds quite a value for the price. The first most notable feature of Pioneer’s SP-FS52 floor-standing loudspeaker is the RF Molded cabinet design. Not only does it look good, but it also reduces the fluctuation of internal waves. Apart from that, there are 3 0.25″ woofers with huge magnets and vents that improve the bass response. Additionally, there’s a 1″ soft dome tweeter that allows for a faster response time. 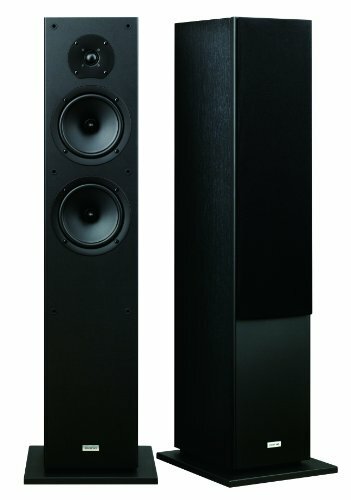 The overall Value Rating of Pioneer’s SP-FS52 floor-standing loudspeaker is 86/100. This is a great speaker for the price, as it’s both affordable and powerful. 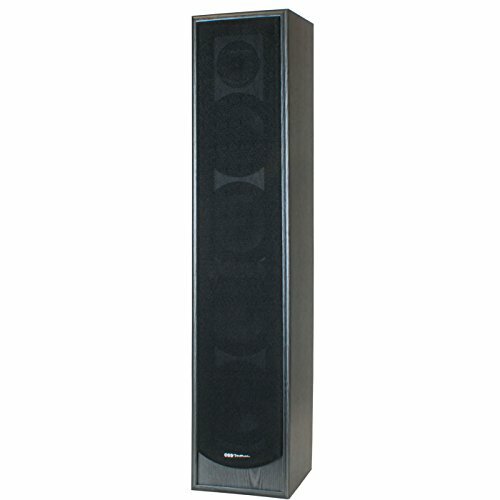 BIC America’s Venturi DV64 floor standing speaker is an affordable, powerful twin speaker. It looks pretty ordinary, but it sounds pretty good, it’s durable, and the features it comes supplied with make it worth the buck. There are some minor flaws which are easily compensated for, but it’s quite decent overall. This remarkable twin speaker comes outfitted with a 0.75″ tweeter, a 5-way video-shielded speaker system, and two 6.5″ poly woofers. The dual passive radiator technology makes sure that the bass response is on point while the sturdy wood-grain cabinet ensures a high level of durability. 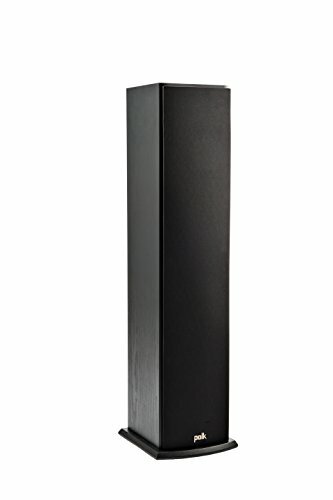 The overall Value Rating of BIC America’s Venturi DV64 floor standing speaker is 92/100. Most people describe these speakers as “good, but not great”, which is to be expected of affordable speaker sets. Nevertheless, the value these speakers hold is great. If you liked Polk Audio’s Monitor 70, you’re going to love their T50 Home Theater model. Namely, the Polk Audio T50 standing tower speaker is the first budget speaker in our list, and it’s simply amazing for the cash. This speaker is compatible with most AV receivers, it comes supplied with a 1″ silk dome tweeter that allows for full-spectrum sound, a 6.5″ composite balance driver for crunchy highs & balanced mids, and two sub-bass radiators. Overall, the soundstage of this speaker is remarkably good for a budget speaker. 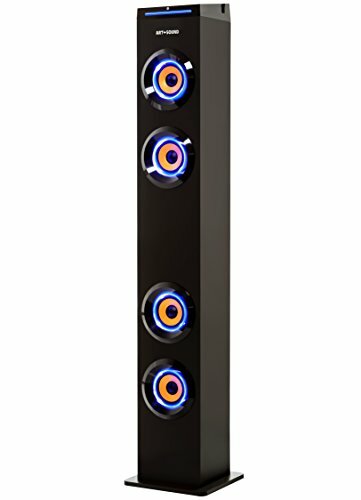 The overall Value Rating of Polk Audio T50 standing tower speaker is 89/100. This might not be the best floor standing speaker on the market, but it’s quite valuable for the price. The last item in our review of the best floor standing speakers is Art+Sound’s AR1004 Bluetooth tower speaker. Apart from the fact that this is the most affordable speaker in our review, it’s actually pretty good for the cash. The design is pretty interesting, the features it comes supplied with is good, and it boasts a high level of durability. Art+Sound’s AR1004 Bluetooth tower speaker is Bluetooth friendly, which means that you can remotely operate it. Furthermore, there’s a built-in subwoofer that allows for full-spectrum sound, and ultra-crisp hi-def sound. The design of this speaker is interesting, to say the least, and it’s decently durable. Last, but not least, the built-in FM radio could be used standalone. The overall Value Rating of Art+Sound’s AR1004 Bluetooth tower speaker is 89/100. If you’re down on cash, this might be a perfect solution for you. ATechReview.com is a participant in the Amazon Services LLC Associates Program, an affiliate advertising program designed to provide a means for sites to earn advertising fees by advertising and linking to (amazon.com, or endless.com, MYHABIT.com, SmallParts.com, or AmazonWireless.com). ATechReview.com is your tech news, review, how to tutorials and shop. We provide you with the latest breaking news, product reviews from tech industry.